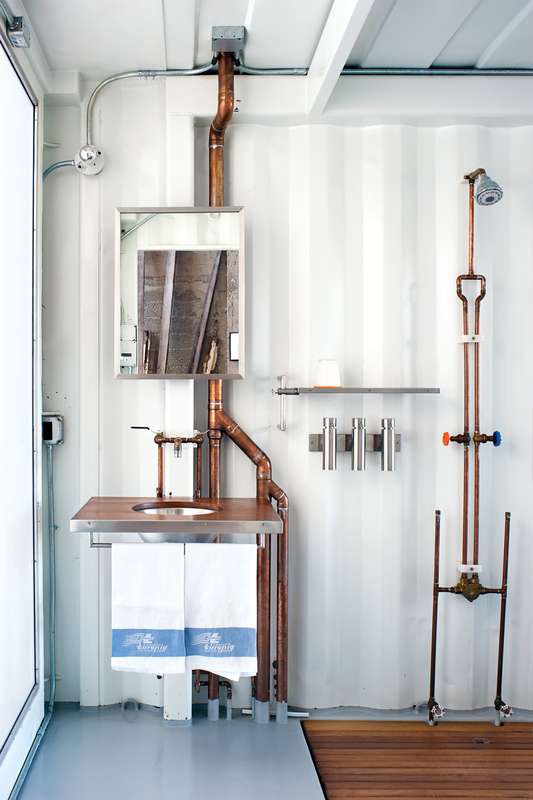 When a pair of San Franciscans recast their loft with a pair of shipping containers, their bathroom got the full industrial treatment. Exposed pipes, copper fittings, and a slate of custom work by designer Pat Carson have made this bathroom a perfect addition to their prefab abode. Though we love the custom teak-and-steel sink, shelving, shower caddy, mirror, shower, and vanity by Pat Carson Studio, the real coup of this bathroom is that the window at left goes from transparent to opaque with the touch of a button. The Duo Poliert dispensers beneath the shelf are from Blomus. A toilet opposite the sink is from Toto.